If you have damaged teeth, dental crowns may be able to restore their function and aesthetics. This well-established treatment can last a lifetime and provide results that look and feel like your natural teeth. Dental Restorative Group’s experience and expertise in placing dental crowns distinguishes its work in Belmont and Greater Boston. Our team of professionals includes both a general dentist and prosthodontists—dental specialists who have years of additional training in restorative procedures. Additionally, we have an in-office dental laboratory and technician located in our Belmont office, allowing us to fabricate and customize your dental crowns more quickly. Learn about our approach to care and why patients choose Dental Restorative Group for their treatment. Crowns are fixed prosthetic devices that your doctor cements on top of your existing teeth. They are meant to be a permanent replacement for portions of teeth that are damaged. 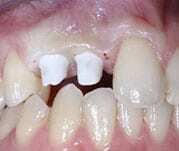 You have weakened teeth that are in danger of fracturing or that have already broken. The existing teeth require fillings so large that crowns are a more effective choice. 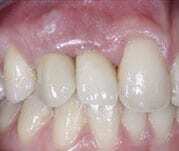 The teeth are discolored or have an unaesthetic shape. You have had a root canal and require a new crown. Dental Restorative Group frequently places dental crowns for patients in Belmont and throughout Greater Boston. The procedure is effective, affordable, and durable, and it is an excellent mid-level treatment for those who may not benefit from fillings but who are not yet ready for dental implants. Our doctors can use dental crowns to re-create the original tooth in shape, alignment, and color. The treatment should last for the rest of your life, and you can care for the crown as though it is your own tooth. Should a dental crown become loose or fall out, replacement is a minor procedure. Carefully follow the body of research related to restorative care. Oversee the crown fabrication process within our own practice. Take time and care in placing crowns so that they fit naturally and comfortably. We also control quality by managing the sourcing of our materials. The dental crowns that we use have proven their effectiveness in scientific trials and range in cost and appearance. This helps each patient find the right solution for their needs. Visit our Belmont, Cambridge, or Arlington location for an initial consultation. Your doctor will evaluate your teeth and determine if you are a good candidate for dental crowns or another treatment option. We provide a high level of transparency when we advise treatments and often go over digital X-rays with patients to explain our recommendations. We welcome your questions and will give you the time you need to make the best decision for your care. Your doctor will first reduce the size of the teeth that will be capped. This allows the crowns to fit over them properly. The doctor will take an impression of the re-sized teeth and determine the appropriate color, shape, and position for your dental crowns. You will receive temporary crowns that will stay in place while our office fabricates the permanent ones. Unlike other practices that send impressions to third-party dental labs for crown fabrication, our professionals oversee their creation to ensure quality and to complete the work more quickly. In a second, follow-up procedure, your doctor will remove the temporary dental crowns and place the permanent ones. You may need a few days to get used to them, but your bite should begin to feel normal after that time. With the help of your doctor, your dental crowns should offer permanent, effective, and attractive tooth replacement. If you have tooth discomfort or damage, you may be a good candidate for dental crowns. Schedule an appointment in Belmont or throughout Greater Boston with Dental Restorative Group.